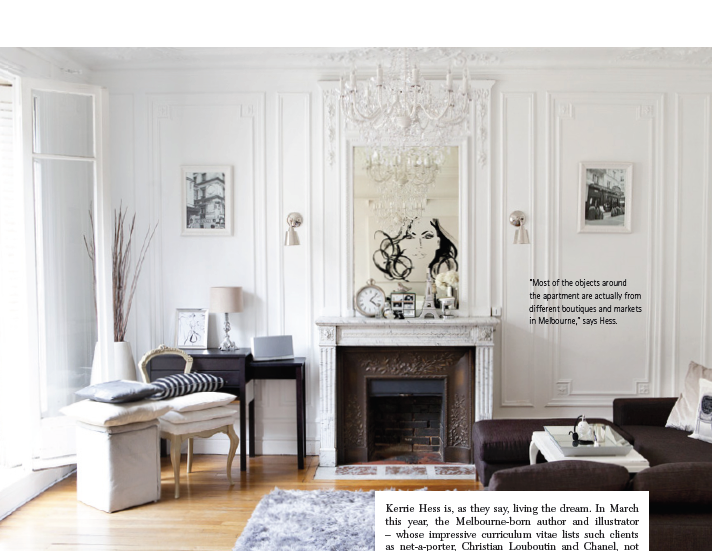 Mix and Chic: Home tour- Kerrie Hess's chic Paris apartment! 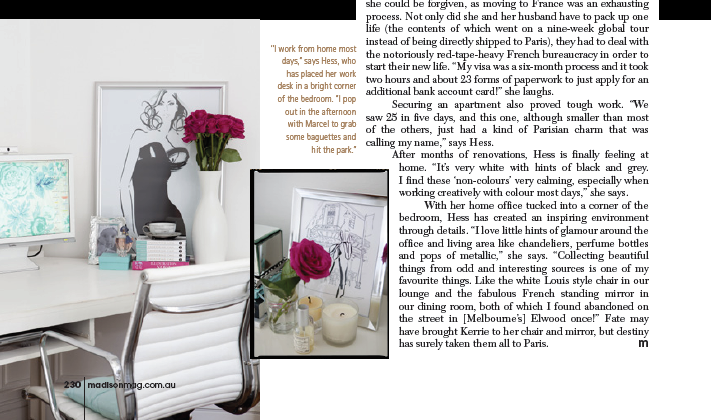 Today, I am featuring the home of the talented Kerrie Hess, a leading fashion illustrator from Melbourne. Some of you might remember her during the giveaway I hosted last month with her new style book named 'Shoestring Chic'. In 'Shoestring Chic', Kerrie provides 101 tips on living the luxe life without spending a fortune, available here. 1) In doubt stick with neutral tones. Unless you have a strong vision of your decorating theme and style, sticking to neutral tones for the more expensive items is usually the best way to recession proof them. (Especially your main sofa, dining table etc.) There is nothing worse than realizing that you wish your very expensive sofa wasn't bright red just a year after you bought it. Soft furnishings are much less expensive to update if you change your mind about them. 2) Do a twice yearly clear out. Often it's too many things in a space that can make it feel chaotic. A full clear out of anything you don't either love or need is a great start before buying anything new for your home. 3) Make friends with spray paint. I once found an amazing old vanity in a charity store (which now sits behind our dining table.) It was originally grey, but I felt that I could bring it to life with a little black spray paint. It cost $25 and it's one of my favorite things in our home. 4) A few pops of metallic tones can add in a little bit of glamour to your home through vases, frames or pendants. The small vintage table lamp in our lounge room was originally gold with a frilly pink shade; also found in a charity store. I sprayed the base silver and changed the shade to one that was simple and modern to balance out the base. Even if your metallic items aren't expensive, just the light they will bounce around the room seems to just add a sense of luxury to any space. Enjoy! There is absolutely no reason that your home cannot look incredibly chic, even if you have to decorate it on a shoestring...! Thank you Kerrie for all your incredible tips on decorating on a shoestring budget! It has been great working with you on this special feature! My lovely readers, I hope you enjoy Kerrie's home tour and find her tips helpful! I love spraypaint as well - I have updates old lamps and furniture - for cool and updates versions. Would adore her Paris pad - J'adore Paris - beautiful magical city. How beautiful. Do you think she'd let me have her life for a few days? So beautiful AND in Paris! The black and white scheme is so chic! So beautiful and what fantastic tips! I love the idea of keeping colors neutral to be 'recession proof'! great post! Fabulous post, Jessie. 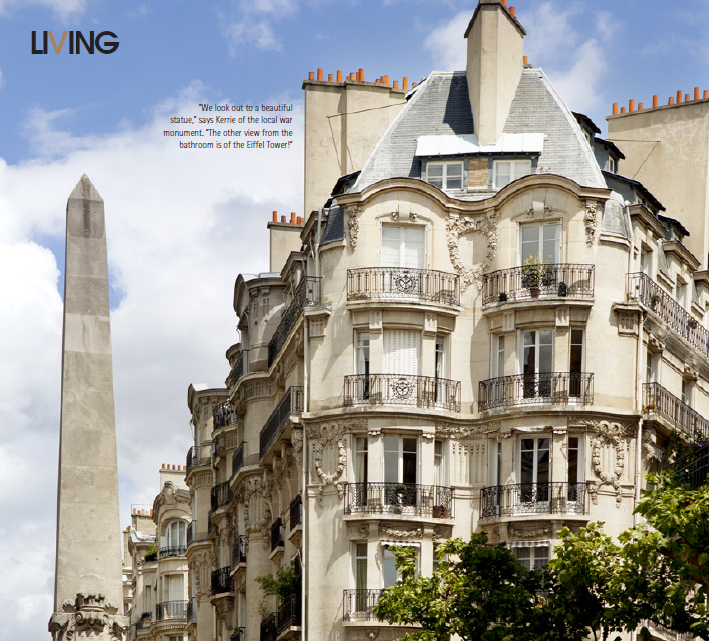 Kerrie's Paris apartment is breathtaking! I especially love the artwork in the dining room. I like her comment about not being a chain store snob. Great advice! Hi Jessie! Thank you SO much for your lovely comment and for becoming a follower!! ... you make 19!! I'm so happy you did because I found your fantastic blog! I lOVE a good home tour. This one was perfect... chic, filled with tips and in PARIS!! I am in LOVE !! This would be my absolute dream place ! Its so gorgeous. Amazing space and her tips are dead on! Wow I'm dying over all of the sketches! What a beautiful home! Would love to have such great style in my house. Wow, beautiful! Since I didn't win...I just ordered her book. She's talented, beautiful and smart...her tips are timeless...at 49 I've never regretted staying with safe neutrals on big items. And spray paint...so true...reinvented many pieces and it's cheap and painless. 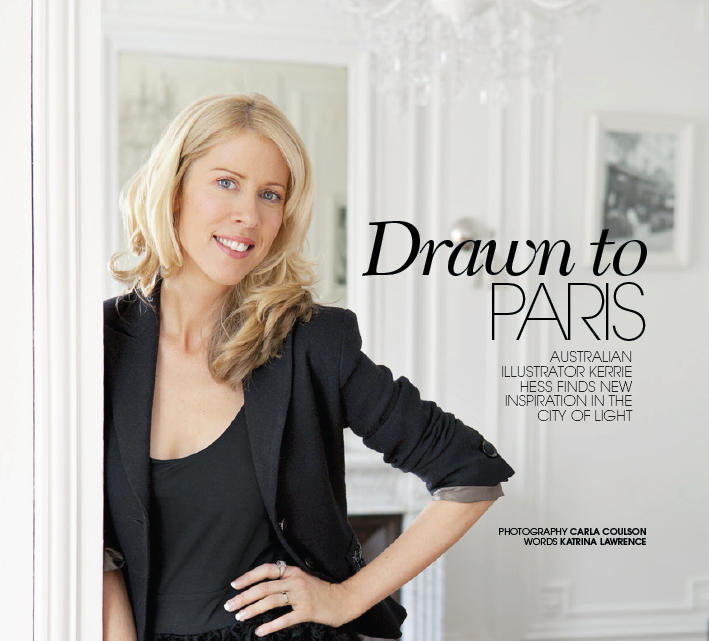 This was such a fascinating article and peek into Kerrie's gorgeous Paris apartment! I really enjoyed the tips too! What a wonderful interview...adore her home and her chic, fresh style!! I think I need to buy her book! Loved her tips. I dream of owning an apartment in Paris one day! Gorgeous from the inside & out! plus it has flowers everywhere. She gives sound advice. The natural light (there is a ton of it) in her home adds to the overall sense of tranquility. Thx for sharing.